article published April, 2018, but first written in 1998 by the webmaster, Paul Smith. Subs:- Francis ( for Euell,36 ), Gayle ( for Leaburn 46 ), Ceri Hughes( for Kennedy, 63 ) - not used Heald; Ekoku. Spurs:- Walker; Carr, Calderwood, Campbell, Nielsen; Fox, Berti, Anderton, Ginola; Klinsmann, Ferdinand. Subs:- Armstrong ( for Ferdinand, 61 ), Saib ( for Fox, 72 ) - not used:- Grodas; Clemence, Scales. 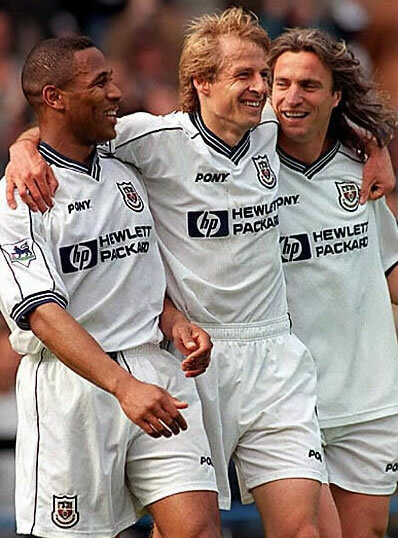 Jurgen Klinsmann doubled his goal tally in one game; repaid his contract; regained his reputation; and ensured Spurs Premiership status all in one go today. This was not, of course a one man show, but today's result will ensure that Klinsmann's reputation, and prestige will be maintained for evermore in the club's history. Surely he has now proved to one and all that his return WAS a good thing for the club. Others worthy of particular mention today are of course Ginola, Ferdinand,and Campbell. Selhurst Park is a difficult ground to reach. I must confess, my last visit was in 1970, when the mighty Spurs were dumped out of the cup by a very lowly Palace side. This was the occasion which led to Bill Nicholson's "Night of the Long Knives", and was to herald my hero - Jimmy Greaves' - last apearance for the club. Hence, I didn't get in until 7 minutes after the start. As I anticipated there was a full house, and there was a full contingent of Spurs fans, who succeeded in making it like a home game for the players. The ground was sun-drenched, but was obviously quite heavy, and bumpy. Most of the so called "articulate" Spurs players thrive on a smoother surface, but overall they seemed to adapt well to the need to strike the ball that bit firmer, in order to get their pass home. Those of us in the Arthur Wait stand never did use the antiquated seats, so for those of you who hanker after terracing for some fans, the experience was there to be had today. So to the game. Spurs looked dominant from the outset. Ginola's flair was always to the fore, and he had the beating of his defender on the left flank all the time. Ferdinand looked strong; Anderton was probing the central midfield; and Klinsmann looked eager. Sadly, Spurs took their foot off the throttle after the goal, and Wimbledon scored two powerful goals through Peter Fear in the 21st and 30th minutes. The first came from a corner on the right, when the ball reached Fear about 30 yards out. Nobody closed him down,and he hit a thunderbolt high into the left corner of the net. I think this was unstoppable from Walker's point of view. Fear's second goal came from within the penalty area, and from a tighter angle, but once again he hit a powerful shot - this time across the goal, and into the net. During this spell, McAllister had a powerful header tipped over the bar by Ian Walker. The main threat of Wimbledon, I find, is that they have forwards built like our Sol, with real pace, and strength, and they are always likely to cause a nuisance. I felt that Leaburn was guilty of a foul in the build up to their second goal, but will have to wait and see MOTD later on. Hindsight is a wonderful thing, I know, but although we were behind, I always felt confident that we were going to get back into the game. I was just commenting how we hadn't seen much of Fox when he did cross a low ball in for Ferdinand who hit a low shot past the goalie's right hand, but also wide of the post. After 41 minutes came the equaliser for Spurs. This goal really belongs to Ginola, who did some marvellous work on the left taking the ball to the bye line, and sending a low cross for JK to get in front of his defender, and guide the ball in. Once again the "Klinsmann wonderland" song resounded around the stadium. Berti also had a goal disallowed in the first half, when he put an accurate header into the corner of the goal, but in fairness the flag was clearly raised before the ball reached him. Ginola dominated the left flank early in the second half, and Wimbledon were forced throughout to play a very physical game, conceding many free kicks. In the 52nd minute, Ben Thatcher went too far. He and Nielsen went for a 50/50 ball, passed back from Ginola. Thatcher paid the ultimate penalty for going in with a lifted two footed tackle. Nielsen was clattered; a melee resulted, and referee Barber sent Thatcher off. This was ultimately the turning point of the game, but let's face it, many teams ( including us ) have had to survive lengthy periods with only ten men, and some have managed to win in such situations. Wimbledon simply caved in, but I prefer to give credit to Tottenham for playing confident, flowing football. Interestingly, the next three goals came from "route one " methods, and it is a little difficult to differentiate between the three. I think I have commented before at how it is noticeable that Gross employs different attacking styles, as any good manager should. It's just refreshing to experience these different styles, when we were exposed to only one for so long. No names mentioned!! So, after 54 minutes, Spurs regained the lead, when Berti pounced on an indecisive defender to set JK up for a low drilled shot. 3-2. The game became one way traffic thereafter, and lo and behold, I had just said to my young son, how nice it would be to see Jurgen get a hat trick, that it happened. This time, I recall he simply ran onto a Walker clearance, and was able to comfortably beat the goalie again. 4-2. "We're staying up" was just one of the chants heralded by this time. The atmosphere was terrific, and I shall always remember with pleasure witnessing this fine win. Jurgen scored his 4th goal after 60 minutes. He apparently became the fastest scorer of three goals in the premiership this season, with his 2nd 3rd, and 4th goals. This time, Anderton, and Sir Les combined to set JK up for another confidently taken shot. Oh, what joy! Soon after, Gross took Ferdinand off, to allow Chris Armstrong to have a run out. I got the impression that Les was not impressed at first, but he did shake hands with Gross in the dug-out. The truth of the matter is that we were never quite so likely to score once Les went off. He is so powerful, and still has the ability to leap like a salmon, AND hang in the air for some time. It looks quite uncanny. By this time, Spurs were able to relax on the ball, and play some exhibition type football. It makes a nice change to be on the side of the fans singing "Can we play you every week"!! Saib replaced Fox after 72 minutes, and impressed with one or two mazy runs into the area, one of which led to a useful shot. In the 79th minute, Jurgen Klinsmann cleverly set up Saib with a back heel, and the Algerian finished in JK style. One interesting footnote:- when Fox was substituted, Sicknote took his place on the right flank! There weren't many Wimbledon fans left in the ground at the end of the game, and David Ginola in particular took some well-deserved applause. He graciously surrendered his shirt to a Spurs fan who managed not only to invade the pitch, but apparently to escape unpunished. The stewarding was quite relaxed all round really. Those stewards behind me were heard to comment "It's a good game isn't it". They're probably not used to it - poor souls. Perry, and Ceri Hughes were booked for Wimbledon. Hughes' booking came for a nasty tackle on Chris Armstrong who ended the game as a bit of a passenger, nursing his ankle - again. Berti was booked late in the game. He was lucky ( in my view ) to escape a little earlier when he deliberately handled the ball on the attack. The game was won by that time, and I suppose the referee was feeling lenient. Christian Gross confirmed after the game that Jurgen would be leaving at the end of the season, and hinted he may be in the market for another striker for next season. Ultimately, today did belong to Klinsmann, and we should all glory in his prowess; our performance; and survival.